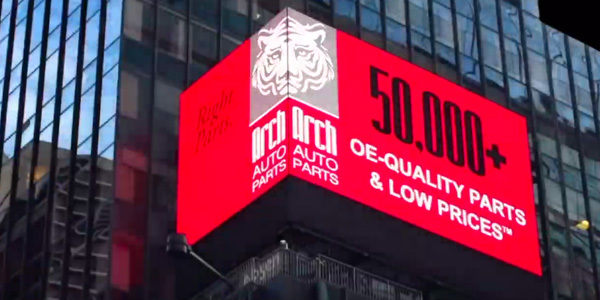 Arch Auto Parts, an aftermarket auto parts supplier in Brooklyn, Queens and Long Island, New York, is celebrating its 40th anniversary with a video billboard in Times Square. 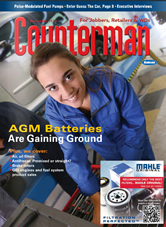 “Throughout the holidays, including the famous New Year’s Eve celebration, millions of New Yorkers seeing the ad are discovering they have a local alternative to the big chain stores, where they can find higher-quality car parts for domestic and import cars, at lower prices, from the best automotive brands,” the company said in news release. The billboard ad proclaims: “50,000+ OE-quality parts and low prices. NY-Fast!” The ad spotlights OE-quality parts Arch stocks from Bosch and DENSO. “When your friend turns 40, you throw them a big party. When your business turns 40, you get a billboard in Times Square and celebrate at one of the world’s biggest parties,” said Chris Bodh, owner and CEO. The Arch Auto Parts ad is running Nov. 15 through Jan. 31 at 1500 Broadway and 43rd Street, in the heart of the Times Square bowtie area, above the pedestrian-friendly Times Square Plaza. This is where the ball drops on New Year’s Eve, the concerts are staged and a worldwide audience estimated at more than a billion people watch on television as they ring in the New Year. Last year on New Year’s Eve alone, approximately 2 million people were packed into Times Square, and most of them were there all day to guarantee a spot before the festivities began. Even on typical days, hundreds of thousands of people pass through Times Square daily, and the billboards are one of the main attractions. This year, these commuters, holiday shoppers and New Year’s Eve revelers will see Arch Auto Parts on one of the biggest platforms in the world. The right side of the billboard features Bosch and DENSO, two of Arch Auto Parts’ top suppliers. The first video is for Bosch ICON windshield wiper blades. Next, the DENSO ad for spark plugs encourages shivering viewers, “If the weather outside is frightful, let’s go find your happy place. With DENSO, you’re ready,” as a classic cruiser drives down a sunny beach. In New York City, there’s a constant flow of traffic between the boroughs. This is especially true on weekdays, with the population of Manhattan nearly doubling from 1.6 million to 3.1 million people on a typical workday. Many of these commuters come in from Brooklyn, Queens and Nassau County, where Arch Auto Parts has a large presence. These areas also have a high concentration of repair shops, so naturally, it’s a destination for buying auto parts. Recently, Arch has been increasing awareness among retail shoppers. So far in 2018, Arch Auto Parts has received more than 440 reviews on Google averaging 4.4 stars out of five.